The following is a partial listing of the DVDs available to members from the club library. Created specifically for beginners, "Bonsai 101" presents a comprehensive guide for the basic care of bonsai trees. Even if you have never owned or cared for a bonsai before, this detailed program will provide you with the information you need to get started and maintain a healthy, beautiful bonsai. Watch a sample on Boon's website here. 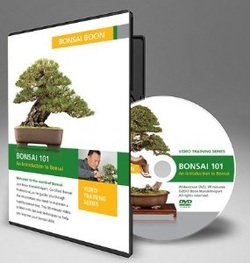 Following the techniques Boon demonstrates on this DVD will help you promote new growth and establish a healthy bonsai. Watch a sample on Boon's website here. Learn the tricks, tips and techniques to successfully bare-rooting and repotting your deciduous trees. This DVD features world renowned bonsai master, Boon Manakitivipart, as he repots a young Japanese Maple from the nursery. Gain useful insight from watching him begin the transformation of this tree into a bonsai. The repotting techniques Boon demonstrates on this DVD apply to all varieties of deciduous bonsai. Watch a sample on Boon's website here. Boon demonstrates decandling to help bonsai artists understand the process and advanced collectors refine their techniques. The relatively new technique of decandling Japanese black pines was discovered in Japan about 40 years ago. It was founded on the principle that a black pine sends out new buds if the spring candles have been removed. The decandling is done in late spring, so these new buds have a shorter growing season and the needles grow shorter. Decandling your Japanese black pine will help promote new growth and ensure a healthy, well-proportioned bonsai. One of the most important steps to a healthy bonsai is repotting. In this comprehensive DVD, international award-winner Boon Manakitivipart repots a 50-year old Japanese black pine. Follow along with Boon as he demonstrates step-by-step how to: 1) Safely remove the bonsai from the pot, 2) Clean and prune the root system, 3) Prep the new pot, 4) Style and wire the tree into the pot, 5) Fill the pot with new soil mix, 6) Water the tree to clear the soil. All of these steps will help promote new growth and ensure a healthy bonsai. 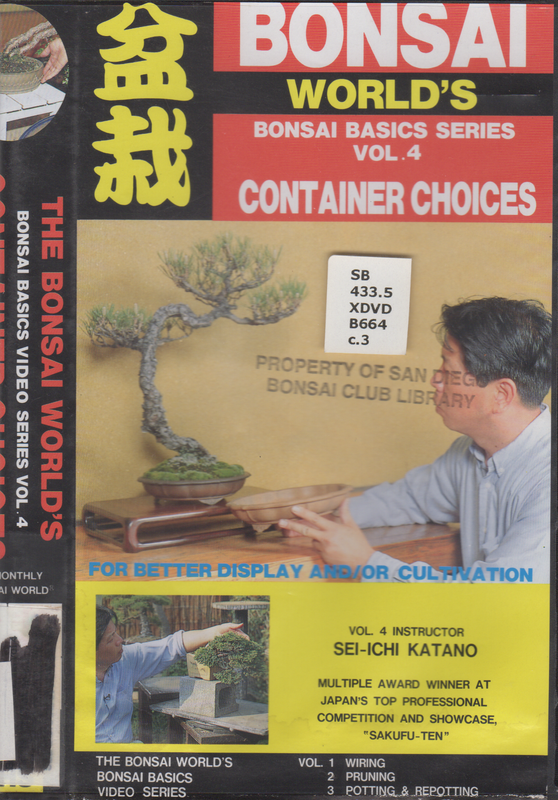 ​In this Japanese video, which has been dubbed over in English, Sei-Ichi Katano describes the various container types. He and a guest then go through possible pots for several bonsai and determine the best choice for each. Sei-Ichi then shows examples of a number of bonsai and explains why he selected the particular pot for that tree and other choices that could be used. The picture quality is not fantastic as this seems to have started out as a VHS recording and was then moved over to DVD later but this does not detract from the information conveyed.